The problem was with three map methods: keySet(), entrySet() and values(). If you read carefully their API you’ll find out that all these methods should return an "interactive" view backed by the underlying map so that changing the view is automatically reflected in the map that returned that view and vice-versa. For example, if you remove an item from the set returned by keySet(), corresponding map entry with this key value should be also removed. Unfortunately, in my implementation these methods simply returned independent copies holding current state (snapshots) of the map. To make matters worse, those were not immutable collections (see Collections#unmodifiableSet) so when user modified them, no errors were issued but also source map remained untouched, effectively hiding the bug. Each MapTest subclass inherits test methods from abstract base class, but providing concrete Map implementation. EhcacheMapAdapterTest is the one of our interest. BTW we’ve actually introduced Template Method design pattern! In this pattern the majority of work (algorithm) is implemented in abstract base classes, but some steps are left intentionally as abstract methods. When using this class, almost everything is done already, all you need to provide are (typically simple) implementations of abstract methods. 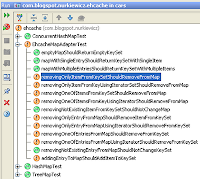 In our case all the logic (unit tests) are gathered in base class MapTest, but the user must subclass it and implement Map factory method createTestMap(). But more on this pattern maybe later. It is not even test driven development. It is rather test driven bug-fixing – somebody reports you a bug and the first thing to do is to write a unit test (since we probably missed one) that fails because of the bug. That’s the best way to reproduce the bug. When we know what is wrong, we are bug-fixing until that (and all existing) test succeeds. This has another benefit – if few months later some developer sees your code, existing unit test will help him to understand why this bug-fix has been applied and prevent from removing it. Try a little of TDB (test driven bug-fixing) and see how great bug-fixing can be, when unit tests tell you exactly, if you’ve done your job correctly. Happy coding! Actually, JUnit has a similar feature, which I have already written about (in Polish, sorry). But I must admit TestNG deals with this case much better by injecting arguments directly to test method, very nice! Let's just say I used JUnit to have an opportunity to present Template Method pattern :-). Though TestNG looks promising, why I've never used it? Of course. :) Template method is very easy to adapt pattern. PS. JUnit's @Parameters have one-to-one eqiuvalent in TestNG using @Factory. also I find it very weird that in every test method you are testing if your "given" block works correctly. I have never sow something like that and IMHO if you have assertions in "when" block thats definitely shows you need more tests methods. but you even have those functionalities checked in different tests so all those assertions are just redundant. Thank you for your comments. I have heard about fest but after not finding it in main m2 repository I forgot about the project. Thanks to your link I found their own repo so I will definitely try it. As for assertions in given block: it is a sort of fail-fast mechanism. If your tests are green it's great. If one or two tests fail, it's still great, because you can locate and reproduce bug quickly. But what if, let's say, 50 tests fail? Where to start, which test failure is the root of all evil? As far as I know in TestNG you can set dependencies on tests, so if one test fails, all tests depending on failing functionality aren't even invoked. There is no such mechanism in JUnit. So, for the sake of simplicity, I check whether my setup code worked properly in order to spot mistakes earlier. Surely when is not the right place for assertions, but, IMHO, it is better to make this little exception and find the cause of red JUnit bar faster. Even for the price of code duplication. Or, maybe it simply time to give TestNG a chance, as suggested above? regarding tests - I disagree with you. In our project that last for 8 months now we have around 1500 unit and integration tests - and we do not "when checking" in any of them. Still we almost always know where the problem is when test is failing - We have junit/fest-assert messages for that. Don't we? But in those rear situations when we do not know - there is debugging. Of course I see your arguments, but still I find it little officiousness ;) It is not only redundant but also makes tests more complicated/less readable. But still it is great to see that more and more people finds TDD as useful (maybe even inseparable?) programing practice.